Nev and Kel are cooking in their instant restaurant on My Kitchen Rules 2016. The couple from Secret Harbour in Western Australia love cooking “honest” food. Their instant restaurant is called Secrets and is a holly wood theme. 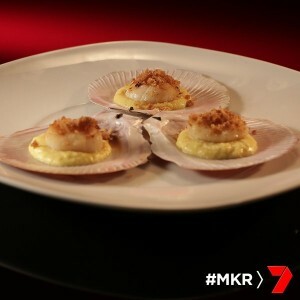 For entree, Nev and Kel are making seared scallops with corn puree and crumbed crackling. For main, they are making apple cider pork belly with fennel chips, honey carrots and gravy. Finally, for dessert Nev and Kel are making apple pie with vanilla ice cream. 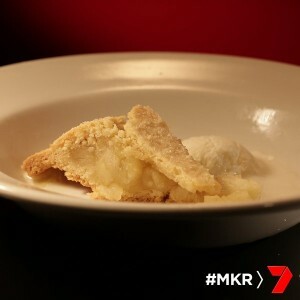 The first thing they did was put the vanilla ice cream on for dessert, then moved to the pork crackling and the belly. Nev injected his pork with apple cider with a syringe, but while he was doing that, he burnt the crackling. It was managed to be saved, it was going to be crumbed and used for the entree, there was enough. They put their apple infused pork belly into the oven. The guests arrive and are very impressed with the fancy restaurant. Nev and Kel get started on the corn puree. The judges arrive and are warmly greeted by Nev and Kel. The menu is revealed. The guests are impressed at how fancy it was, it wasn’t what they were expecting. Jessica and Marcus didn’t think the menu was too intimidating. Nev and Kel get back into the kitchen to continue preparing the entree. They cook a scallop to check their timing, they do not want them overcooked. The scallops are placed back into their shells on top of the corn puree and the pork crackling is sprinkled on top. The entree is taken out to the guests. Pete and Manu taste the dish. Pete says it was a delightful little entree. He says the scallops were cooked perfectly.Manu says the dish is fantastic and the corn puree is silky smooth, his only criticism is that the pork crackling is a little too hard. The other guests taste the dish. They love the creamy corn puree and the scallops. Marcos said the pork crackling was like glass shards in his mouth. Nev and Kel get back into the kitchen and check on the pork belly. They are very happy with how it is cooked as it is very tender. They place the pork back into the oven under the griller to get the skin to crackle. Kel gets started on the apple crumble. They make a start on the fennel chips but they were soggy and they’re not happy. During the conversation at the table Jess says she doesn’t eat oil so she’s worried that the fennel chips are going to just taste like oil. The other contestants are wondering what ingredients Jessica and Marcus will cook with as she doesn’t like so many things. Back in the kitchen Nev is still working on the fennel chips and Kel prepares the carrots. Nev is so focused on the chips he has forgotten the pork belly that is under the griller and it starts to burn. Kev is still not happy with the fennel chips. He decides not to use the tempura batter and just uses the fennel on their own. They still don’t cook very well and they’re not happy with them. The gravy has reduced too much and they’re worried that there is not enough gravy for everyone. Nev is really upset with the look of the dish. They plate it up and take it out to the guests. The judges taste the dish. Nev is really regretting putting the fennel chips on the plate. 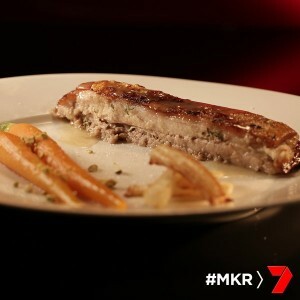 Manu says the pork melts in his mouth and the crackling was great but the fennel chips were no good, the carrots too hard and the sauce over reduced. Pete loves the pork too but was disappointed with the soggy chips. The other guests taste the dish. They are not overly impressed with the pork and they all did not like the fennel chips. Nev and Kel get back into the kitchen and are woking on making the apple pie. They were hoping to be more organised than they are. They still need to make the pastry and cook the apples. The pastry alone needs 20 minutes to rest in the fridge. They take hte pastry out of the fridge and roll it out. They are stressing that they will not have enough for everyone. The apples aren’t cooked as long as they would like but they finally get it into the oven. The guests have been waiting over an hour for the dessert. The ice-cream has come out well. Now the guests have been waiting for 2 hours for their dessert. The pie finally comes out of the oven and they try and get it out to the guests as soon as possible but they pie is falling apart and has crumbled everywhere. They plate it up with messy scoops of ice cream and it looks terrible. The guests instantly know that something has gone wrong in the kitchen tonight. The judges taste the dish. Manu says he’s not happy and that theyve missed the mark on this one. The ice cream looks like a cheap bought one. He says they have rushed this dish and that there is no love in this dish. Pete says the vanilla ice cream wasn’t good. The consistency of the apple pie wasn’t good. The other guests get to taste the dessert. They are all underwhelmed. It’s time to hear the judges scores. This places Nev and Kel at the bottom of the leader board. Tomorrow it’s finally time to see Jessica and Marcos cook. We’re expecting big things!